Ketogenic dieting can be a game changer for many people, but it can be frustrating and counterproductive if done incorrectly. Have your burning keto-queries answered by Dr. Jake Wilson! Ketogenic dieting is more popular than ever these days, but unfortunately, that doesn't mean it's more understood than ever. In fact, given the many different names, styles, and goals that get associated with the term, the confusion seems to be growing! After researching ketogenic dieting for years and studying it firsthand in the lab, I believe it has a lot to offer to a wide range of people who want to burn fat, hold on to muscle, and live the healthiest life possible. Researchers have been digging into the details of ketogenic dieting for decades, but there's also fascinating new science happening in this area all the time. So, I'm devoting this installment of "Ask the Muscle Prof" to answering the most common questions I hear about ketogenic dieting. In addition to the questions I’ve answered in the article itself, I also did a live Google Hangout answering the most common questions from readers! After you’ve read the article, check it out at the bottom of the page to have even more of your burning keto questions answered in details! My goal is for you to have no excuse not to know what's going on in this exciting part of the nutrition world! The Terms "Fat-Adapted," "Keto-Adapted," And "In Ketosis" All Get Mixed Up Online. Do They Mean The Same Thing, Or Are There Differences? This is a great question. Ketosis is induced when carbohydrates in the diet are too low to provide the exclusive fuel source for the body, usually lower than 50 grams per day. When this occurs, you enter into a unique metabolic state in which the liver produces small organic molecules called ketone bodies at sufficient levels to allow your brain, organs, and muscles to function using them and fat as fuel. Someone consuming a "traditional Western diet" has a blood ketone level that's typically around 0.1 to 0.2 mmols. However, when consuming a truly ketogenic diet—something like 75 percent fats, 20 percent protein, and 5 percent carbs—your blood ketones can raise to somewhere between 0.5-5.0 mmols, putting you in a state of "nutritional ketosis." That's a wide range, I know, and you'll find ketogenic dieters at all points of it. Our lab has done a lot of research on ketogenic dieting, and we have worked with various ways like Wingates and different fat sources that can get our subjects to register high levels of ketones within days. However, even with this, they often feel tired, foggy, and sluggish during the initial period of the diet. Following a period of two weeks, however, we have noticed that blood ketone levels do rise. More importantly, people regain their focus, drive, and mental acuity. The crossover point you enter after 2-6 weeks of dieting is known as "keto-adaptation." Keto-adaptation is a unique metabolic state in which your body shifts its primary fuel source from carbohydrates to fat and ketones. The process involves increasing your tissue's ability to oxidize (burn) fat and utilize ketones. To illustrate my point, the average amount of fat individuals use during exercise is about 30 grams an hour. However, Dr. Steve Phinney found that after six weeks of keto-adaptation, individuals used on average 90 grams of fat per hour during exercise! These outcomes make fat adaptation synonymous with keto-adaptation. "Ketosis is induced when carbohydrates in the diet are too low to provide the exclusive fuel source for the body, usually lower than 50 grams per day." 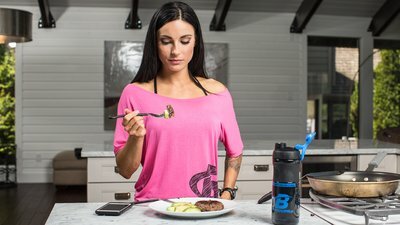 What Are The Most Common Mistakes People Make When Going Keto? To my first and second points, it's important to realize that elevating blood ketones is absolutely essential to the success of this diet. A landmark study by Dr. Young and colleagues took college students and gave them all the same amount of protein and calories, and put them in a calorie deficit. The three groups ate 104, 60, and 30 grams of carbohydrates per day respectively, while consuming the same amount of overall calories. What happened was intriguing, to say the least. In the 104-gram carb group, 25 percent of the weight lost was in the form of muscle, while the 30-gram group lost virtually no muscle. The takeaway is that very low levels of carbohydrates are essential for full keto-adaptation to take place. This is important because ketones have been shown to prevent amino acids like leucine from being broken down, and thus likely spare muscle. Consuming too much protein might not sound like a bad thing, but it is important to understand that a ketogenic diet is very high fat (70-75 percent), very low carbohydrate (5 percent), and moderate in protein (20-25 percent). Some bodybuilders get up 40 percent of their diet from protein, 50 percent from fat, and 10 percent from carbohydrates. However, when protein is consumed above 1.5-1.8 grams per kilogram of body weight, it actually increases the formation of glucose, which we have found in our lab makes it difficult to get individuals into ketosis. In fact, research has shown that this kind of diet can actually be detrimental to both muscle and strength. It's also crucial to allow a long enough adaptation period. Most people stop ketogenic dieting before they fully adapt. As I mentioned earlier, several studies show that during the first few days of ketogenic dieting, exercise performance drops. [8,3] But once you adapt, you can gain as much lean mass and strength on a ketogenic diet as you can on a higher-carbohydrate diet. [9,10] Some carb-happy lifters might scoff at that idea, but our lab recently teamed up with Dr. Mike Roberts at Auburn University and we saw it firsthand! Let's Talk About Fats. Isn't There Research Showing That High-Fat Diets Have Negative Health Effects? Is There Such A Thing As Too Much When You're Keto? How Do We Find The Balance Between Fats And Protein? You can find an endless number of studies concluding that "high-fat dieting" causes insulin resistance and obesity, increases bad cholesterol, and leads to cardiovascular disease. However, I have to emphasize that the studies showing problems with high-fat diets should actually be labeled as high-fat, high-carbohydrate diets. This is known as the "typical western diet," and has led to myriad health problems. However, Bob Wolfe's lab found that when they infused fat by itself into the blood, it was simply used as fuel. But when these researchers infused fat along with carbohydrates, the fat was prevented from being used as fuel and insulin resistance began to occur. Why does this happen? The primary reason is that fats require a particular enzyme, CPT1, to transport them into the mitochondria. High amounts of insulin inhibit this transporter and thus prevent fat oxidation. For this reason, during a ketogenic diet, the carbohydrates must be very low so that they don't impede fat getting used as fuel. But under these conditions, research has shown that ketogenic dieting can have a number of health benefits, such as lowering blood triglycerides and cholesterol and improving insulin sensitivity. As far as finding a balance between fats and proteins, the key is selecting cuts of meat and dairy that are not low-fat. That might be hard for some of you to accept at first! When leaner cuts of meat are all that's available, I would suggest adding fat to the meats. Cook them in butter or bacon grease. Don't throw that grease in the trash anymore! Is A Weekly Carb-Heavy Cheat Meal Or A Cheat Day Enough To Ruin Someone's Ketogenic Master Plan? Many people can't see themselves doing a strict ketogenic diet for long periods of time. For this reason, several variants of the diet have become popular. Unfortunately, very few of these have been examined in a research setting. One method is known as "cyclic ketogenic dieting." During this diet, individuals do a strict ketogenic diet for 5 days and then "carb up" for 1-2 days. Our lab recently compared cyclic ketogenic dieting to normal ketogenic dieting. We calorically restricted subjects by 500 calories a day, and the cyclic subjects had a normal carbohydrate diet on Saturday and Sunday. On top of this, the subjects performed high-intensity cardio and resistance training. Both groups lost 3 kilograms of body weight—but there's a really big catch. The group that followed a strict ketogenic diet lost nearly all fat, while the cyclic ketogenic group lost 2 kilograms of lean mass. Why did this happen? While the traditional keto group was in ketosis all week, the cyclic group did not enter into ketosis until Thursday. Thus, they were only in very mild ketosis twice a week. Additionally, while the ketogenic diet went up in strength and strength endurance, the cyclic group declined. This definitely indicates that extreme cyclic ketogenic dieting prevents individuals from adapting. We have also shown that reintroduction of a large amount of carbohydrates after 10 weeks of ketogenic dieting resulted in large increases in fat in only a week. On the other hand, we followed this up recently and examined what happens when you reintroduce carbohydrates slowly, like 1 gram per kilogram of body weight at a time. Guess what? We found no increases in body fat. This tells us that extreme fluctuations are not the way to go. However, small increases in carbohydrates may be a viable option to consider when coming out of a ketogenic diet. It is also possible that consuming these carbohydrates prior to exercise would blunt any negative effects, as exercise blunts the general insulin response to a meal. However, more research is needed here before I feel confident making definitive recommendations. Is There A Better Way To Cycle Ketogenic Dieting? Not everyone can manage strict keto year-round. I get it—and that's fine! One alternative is using ketogenic dieting for short periods throughout the year, with a conservative bridge between extreme ketogenic dieting and normal-carbohydrate dieting. It was found that subjects lost body fat during each ketogenic burst and maintained the loss during the subsequent maintenance Mediterranean-diet phase. Also amazing was that, of the 89 subjects who participated, only 8 dropped out in this study, which lasted over a year! Now that's compliance. So How Can I Put This All Together? Ketogenic dieting can be extremely rewarding for both performance and physique-based goals. The existing research definitely suggests that you can lose a great deal of fat and spare muscle while using this strategy. However, you need to fully commit during those periods when you aim to go into ketosis. No cutting corners! "Ketogenic dieting can be extremely rewarding for both performance and physique-based goals. The existing research definitely suggests that you can lose a great deal of fat and spare muscle while using this strategy." This means keeping your fat at 75 percent, and carbohydrates at less than 5 percent. If you're interested in adding carbohydrates back in, I would caution you to be very conservative and limit this to once a week, on a hard training day. You will need to monitor yourself to ensure you are able to rapidly get back into ketosis. Invest in some Ketostix or something similar and get serious about tracking your ketone levels. Finally, if you are wanting to transition out of a ketogenic diet, you should do so conservatively. One option is to start by introducing carbohydrates at 1 gram per kilogram of body weight per week until you are back to the normal range. Regardless, avoid rapid reversals to carbohydrate diets. My final piece of advice is to give yourself time to adapt. You will need the full two weeks before you truly realize the benefits of being keto-adapted. Use them, and embrace this as the truly unique nutritional approach that it is! Kennedy, A. R., Pissios, P., Otu, H., Xue, B., Asakura, K., Furukawa, N., ... & Maratos-Flier, E. (2007). A high-fat, ketogenic diet induces a unique metabolic state in mice. American Journal of Physiology-Endocrinology and Metabolism, 292(6), E1724-E1739. Young, C. M., Scanlan, S. S., Im, H. S., & Lutwak, L. (1971). Effect on body composition and other parameters in obese young men of carbohydrate level of reduction diet. The American Journal of Clinical Nutrition, 24(3), 290-296. Palaiologos, G., & Felig, P.. (1976). Effects of ketone bodies on amino acid metabolism in isolated rat diaphragm. Biochemical Journal, 154(3), 709-716. Azzout-Marniche, D., Gaudichon, C., Blouet, C., Bos, C., Mathé, V., Huneau, J. F., & Tomé, D. (2007). Liver glyconeogenesis: a pathway to cope with postprandial amino acid excess in high-protein fed rats? American Journal of Physiology-Regulatory, Integrative and Comparative Physiology, 292(4), R1400-R1407. Rhyu, H. S., & Cho, S. Y. (2014). The effect of weight loss by ketogenic diet on the body composition, performance-related physical fitness factors and cytokines of Taekwondo athletes. Journal of Exercise Rehabilitation, 10(5), 326. Leveritt, M., & Abernethy, P. J. (1999). Effects of Carbohydrate Restriction on Strength Performance. The Journal of Strength & Conditioning Research, 13(1), 52-57. McCleary, S. A., Sharp, M. H., Lowery, R. P., Silva, J. E., Rauch, J. T., Ormes, J. A., ... & Wilson, J. M. (2014). Effects of a ketogenic diet on strength and power. Journal of the International Society of Sports Nutrition, 11(Suppl 1), P41. Rauch, J. T., Silva, J. E., Lowery, R. P., McCleary, S. A., Shields, K. A., Ormes, J. A., ... & Wilson, J. M. (2014). The effects of ketogenic dieting on skeletal muscle and fat mass. Journal of the International Society of Sports Nutrition, 11(1), 1-1. Mobley, C.B., Holland, A., Kephart, W.C. Lowery, R.P., Mumford, P. Wilson, J.M., and Roberts, M.D.. (2015) The anabolic skeletal muscle response to acute resistance exercise is not impaired in rats fed a ketogenic diet. Journal of the International Society of Sports Nutrition (Conference Abstract). Zeyda, M., & Stulnig, T. M. (2009). Obesity, inflammation, and insulin resistance—a mini-review. Gerontology, 55(4), 379-386. Sidossis, L. S., & Wolfe, R. R. (1996). Glucose and insulin-induced inhibition of fatty acid oxidation: the glucose-fatty acid cycle reversed. American Journal of Physiology-Endocrinology And Metabolism, 270(4), E733-E738. Sharp, M.S., Lowery, R.P., Shields, K.A., Hollmer, C.A., Lane, J.R., Partl, J.M., ... & Wilson, J.M. (2015). The 8 Week Effects of Very Low Carbohydrate Dieting vs Very Low Carbohydrate Dieting with Refeed on Body Composition. NSCA National Conference, Orlando, FL. Goodyear, PhD, L. J., & Kahn, MD, B. B. (1998). Exercise, glucose transport, and insulin sensitivity. Annual Review of Medicine, 49(1), 235-261. Paoli, A., Bianco, A., Grimaldi, K. A., Lodi, A., & Bosco, G. (2013). Long term successful weight loss with a combination biphasic ketogenic mediterranean diet and mediterranean diet maintenance protocol. Nutrients, 5(12), 5205-5217.